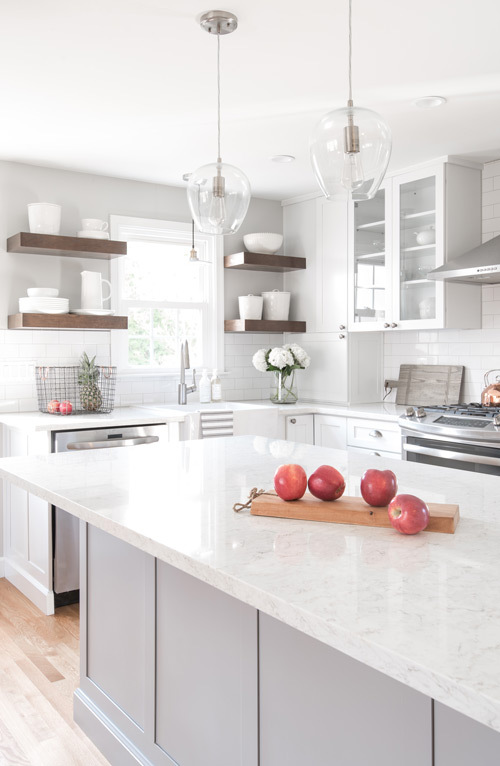 So here’s a kitchen “trend” that’s not going anywhere– open shelving! This is an element that’s steadily become a staple in kitchen design and I really don’t think there’s any going back! Some people love it, some hate it, some like the concept but are scared to try it. I think anything this polarizing is worth talking about. Aesthetically, I personally love the way it helps open concept kitchens blend with the adjacent living areas. Functionally, I have struggled a bit over the years with the very legitimate concerns raised by clients. Like with any design dilemma, there are significant pros and cons. If you’re currently remodeling or THINKING of remodeling, this seemingly small detail will have a HUGE visual and functional impact, potentially leading to some serious indecision. 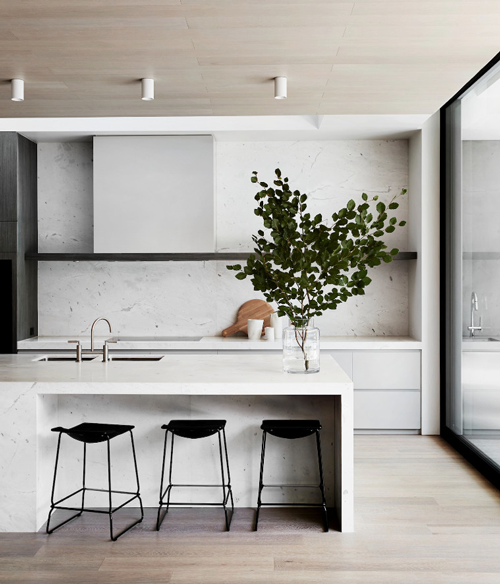 How fresh is this light-filled kitchen though? If this image doesn’t make you want to tear out your upper cabinets, just stop reading now! Visually opens up the look of the kitchen compared to traditional upper cabinets which can feel heavy (even with glass or mesh panel inserts). Looks less “kitchen-y”. 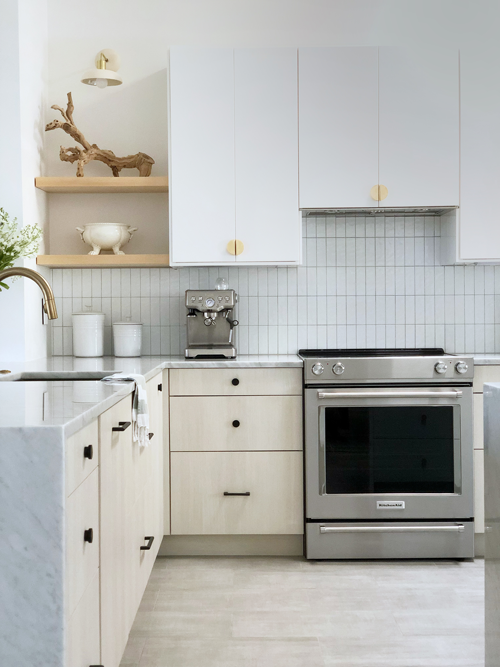 By ditching the traditional upper cabinetry look and bringing in objects you would typically find in other areas of the home (art, objects, etc)– see pro #4. Provides opportunities to display beautiful kitchen (and non-kitchen objects) as sculpture without cluttering up the counters. Creates special lighting opportunities (sconces I’m looking at you). Allows for additional texture and color possibilities as well as freedom of design (metal, wood, glass…). Dust, dust, and greasy dust. Potentially cluttered appearance (if not styled well). Potentially less efficient use of wall space compared to traditional upper cabinetry. If these are concerns for you, I’ve found the answer lies in DEGREES of open shelving. It doesn’t have to be all or nothing, there’s a spectrum–and the answer depends on each individual circumstance. That said, even a small amount of open shelving creates a nice variety and simplifies the visual bulk of upper cabinets. Let’s look at some examples! 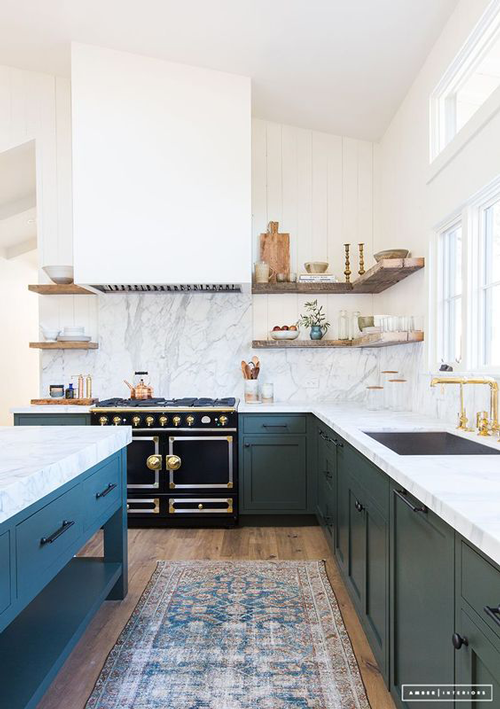 This mix of upper cabinets and open shelving (below) works because the shelves hold some of the day-to-day dishes that are used frequently (convenience factor, no dust accumulation) and serving pieces that are used infrequently (visual display factor, will need a rinse prior to use). Keeping these items a uniform color also streamlines the look and reduces the tendency to appear cluttered. Another perk is the opportunity to introduce another element of texture, color, warmth via the shelving material you select. 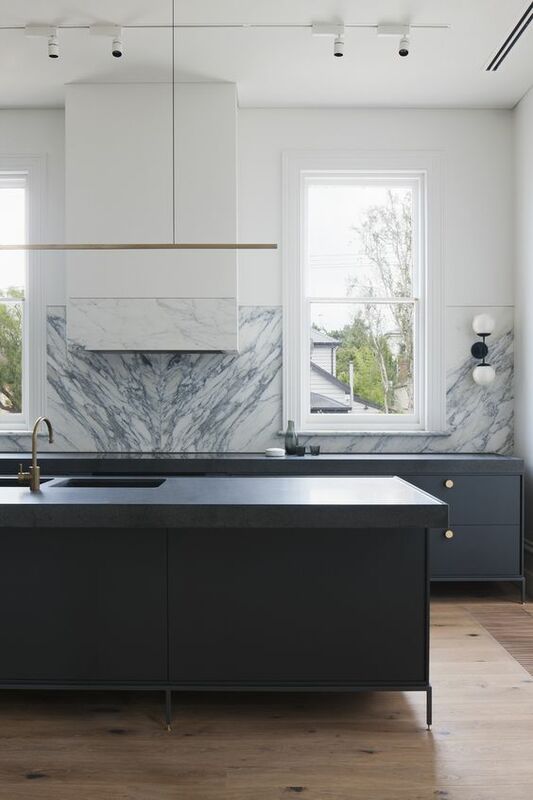 In the example above, the dark wood provides much needed contrast in an otherwise white kitchen. On the other hand, the maple shelves in the below example complement the lighter wood, but add more warmth to the back all-white wall. If you really need the storage and don’t want to fully commit, I’m a huge proponent of adding just a touch of open shelving. This is the approach I chose for my own kitchen! The below shelves are about 24″ wide and hold objects that bring an organic shape and interest to the space, but could just as easily hold stacks of plates, cups, etc. if additional storage became necessary. One of the best perks of open storage is the opportunity to add another layer of lighting, like this wall sconce. You can sometimes add sconces in other areas (like if you’re blessed with kitchen windows), but generally there isn’t available wall space for both sconces AND upper cabinets in an open concept kitchen, and this extra layer of lighting really enhances the kitchen ambience. 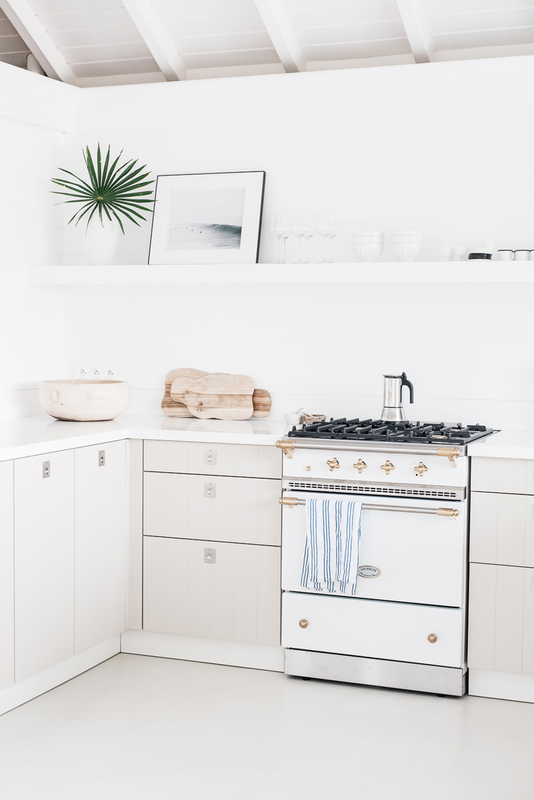 You can also plan to gain additional storage by carefully reworking what you currently have, or squeezing extra storage into an island or strategically adding full-height cabinets. In the below image, there is a single floating shelf, but to the left you can start to see the 6 feet of floor to ceiling storage that compensates for the more streamlined look on the right. Most kitchens were not designed with your needs in mind (or anyone’s for that matter!) and don’t make efficient use of storage anyway. Drawers and pull-outs are your best friends when it comes to maximizing storage. You can easily pack much more EFFICIENT storage into your same, existing footprint, affording the opportunity to reduce the need for wall storage. Drawers and pull-outs will give you much more bang for your [storage] buck! Here is an example illustrating the opportunity to layer in another material (where the upper cabinets would normally be), providing texture and color. This approach really accents the openness of the space created by the single floating shelf and is a beautiful contrast (and complement!) to the upper cabinets to the right of it. You can tell the island and cabinet drawers provide a ton of added storage in this extreme example of NO wall storage! That open wall really lets the stone backsplash shine, as well as the sconces, and the end result is such a standout. Shifting gears a bit, look at how sneaky the cabinetry is in this example. There are always ways to get the look you want with the function you need. 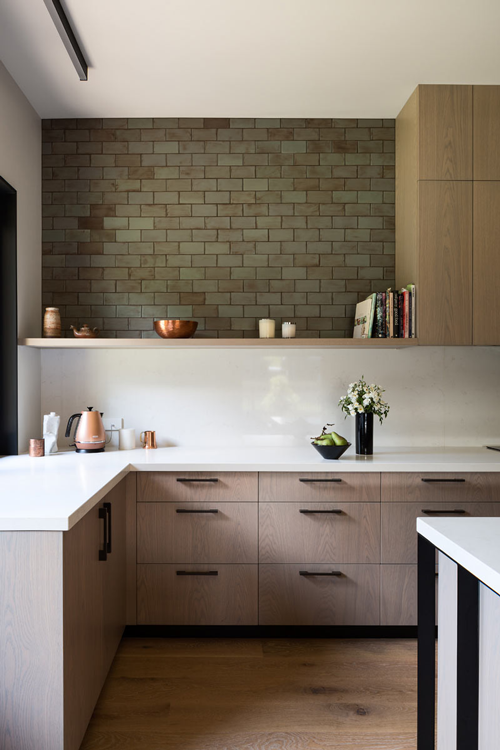 The storage below blends seamlessly with the hood cladding and wall paneling to create a fully integrated look. 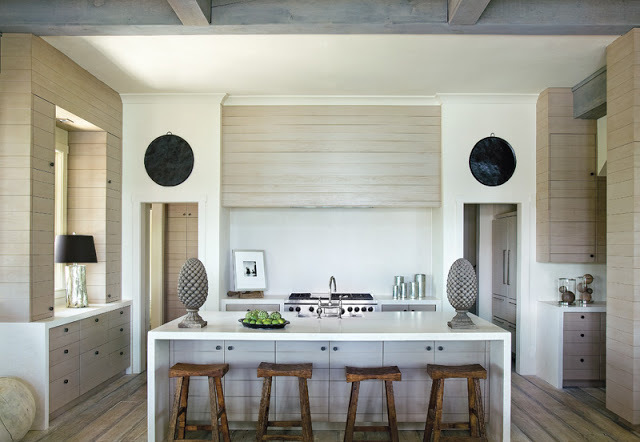 By making the range and hood wall a focal point with no storage, they were able to create a very minimal streamlined look while packing in upper cabinetry, island storage, floor to ceiling cabinetry, entire storage rooms everywhere else. So what’s your comfort level on the open shelving spectrum?